This morning I’ve been thinking about the ‘Preston Model’ and how this model of ‘new municipalism’ might inform bioregional praxis – with special attention to how it might work out here on the Dengie. In my workshop on bioregionalism at the UK Permaculture Convergence in September I briefly mentioned the Preston Model as a possible technique that might emerge as appropriate from a bioregional design and now seems a good time to think some more about that. I’m generally not keen on beginning with a technique and working backwards but going through some survey and analysis of the local economy with the model in mind may help reveal aspects that would otherwise be unapparent. The ‘Preston Model’ is a descriptor for how Preston City Council in collaboration with ‘anchor institutions’, local businesses, and co-operatives are implementing a strategy of community wealth building through local procurement and investment – within Preston and the wider Lancashire area. It offers a model for encouraging local production to meet local needs supporting local employment and living wages. One exciting aspect of the Preston Model (and broader trends within radical municipalism) for bioregional praxis is a powerful social engagement within the local context. This balances well with the ecological weighting of much of bioregionalism, and the combination of the two would create a sturdier basis for a resilient future based on the ethics of care of the Earth, care of people, and equity. In the UK, educational establishments have generally been the most common actors playing the role of anchor. In Preston three HE/FE establishments are named anchors: the University of Central Lancashire, Preston’s College, and Cardinal Newman College. Also working with Preston City Council (the ‘place leader’) are some other Preston based institutions: Lancashire County Council, Community Gateway Housing Association and Lancashire Constabulary. In considering these elements, the scale differences between Preston and the Dengie quickly become apparent. Preston is the administrative centre of the county of Lancashire, making its closest Essex analogue the City of Chelmsford. My home town Burnham-on-Crouch is near, as the crow flies, to Essex’s three largest settlements and sits between them – Chelmsford is about 15 miles away to the west, Colchester 17 miles to the north, and Southend-on-Sea just 10 miles away to the south. All of these settlements house anchor institutions, but the actual topography of the county precludes easy access from Burnham to these settlements – river estuaries separate us from both Colchester and Southend-on-Sea, while Chelmsford is a 40 minute car journey, an hour-and-a-half by pubic transport, a 2 hour cycle ride or a 6+ hour walk. The Non-metropolitan district of Maldon is one of the least populated districts in England (ranked 311/326 in the 2017 ONS estimation). It’s largest settlement Maldon has a population of only 21,462, with the second largest settlement, Burnham-on-Crouch having 6,905 (both counts from the 2011 census). Unsurprisingly therefore, it is lacking in ‘anchor institutions’ – it contains no HE establishment, the small St Peter’s community hospital faces closure (with uncertain plans for replacement), the Centre for Environment, Fisheries and Aquaculture Science laboratory in Burnham-on-Crouch closed in 2008, Bradwell nuclear power station ceased generation in 2002. Locally, some hope is invested in plans for a new nuclear power station in Bradwell and an economic multiplier effect it might have – but it’s currently uncertain what the local economic benefits woudl be if it is approved. The previous plant employed c.900 people, but the Bradwell B website claims that a new plant would ‘create thousands of employment and apprenticeship opportunities in a broad range of occupations and careers’ and suggest that a comparison be made with Hinkley Point C in Somerset which it suggests will bring around £40 million into the local economy every year during operation. A recent strategy document (pdf) on economic prosperity produced by Maldon District Council reports that while there are over 4,300 businesses located in the District creating nearly 24,000 local jobs, the economy is characterised by small and medium enterprises (SMEs) with 75% of companies in the Maldon District employing 4 staff or fewer. 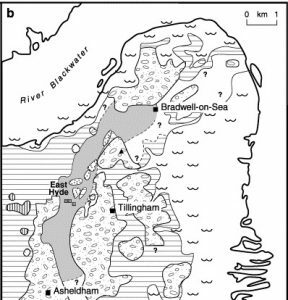 This seems to indicate that the Preston Model is an awkward fit for an area with the scale and characteristics of Maldon District. However, while demand for goods and services is lower than larger populated areas, it might still be optimised to local supply and be nested within county-wide local/regional sourcing initiatives. One of the advantages of large anchor institutions, however, is that influencing purchasing decisions of high-value might be done through communication with a handful of organisations which can lock-in procurement over a long time period. In an economy dominated by SMEs there are a multiplicity of actors, working to shorter planning time-frames, with greater susceptibility to market conditions. This increases communication costs and decreases stability. There might be opportunities here instead for something more like the ‘regenerative enterprise ecosystems‘ complexing to ‘local living economies’ pointed towards in the work of Ethan Roland, Gregory Landua and others. The language might need to be tweeked a little, but much of the basic concept is well aligned with the aims of the local Chamber of Commerce. As Maldon District Council alone spends several million every year, and the largest sector of the local economy by employment number is ‘public administration, health, education and social care’ – there clearly remain opportunities for ‘new municipalism’ type activity however, even in a largely rural district. The construction of on- and off-shore wind farms in the area, as well as a solar farm and the proposed nuclear power station also indicate that the area has realised and potential energy resources. These are made possible up by local planning decisions over land use, planning decisions which could be leveraged by the local authority towards community ownership and community wealth building. So far these opportunities have not been optimised. While the on-shore wind farms distribute annual community benefit funds to charitable projects that will assist people living and working near them, there are no community-led clean energy projects or energy co-ops. Instead of community ownership we have supplication, and with most of the profit from energy production leaving the region this is a drain on the local economy where there could be a stimulus. The decision to promote development of Bradwell B by a consortium of foreign corporations (Électricité de France and the China General Nuclear Power Group) that will necessarily offshore profits and public subsidies, while leaving legacy de-commissioning and waste costs underwritten by the public purse and inflexible, high fixed set-prices for the electricity produced, needs to be weighed against the speculative economic benefits of the plant. Also, as other have noted, the security requirements of nuclear plants tend to necessitate centralised control by distant bodies rather than local oversight and are therefore inherently undemocratic, The controversial recent decisions to discharge dissolved radioactive fuel rod casings into the Blackwater Estuary, and to transport nuclear waste from other sites to Bradwell for interim storage have both highlighted the limits of local authority over atomic energy projects. positive exemplars shouldn’t be fetishized, rather, these innovations — as well as others that are producing positive results — should be understood, adapted, further developed, and multiplied wherever it makes sense to do so.